Our review of a simple ceramic French press. 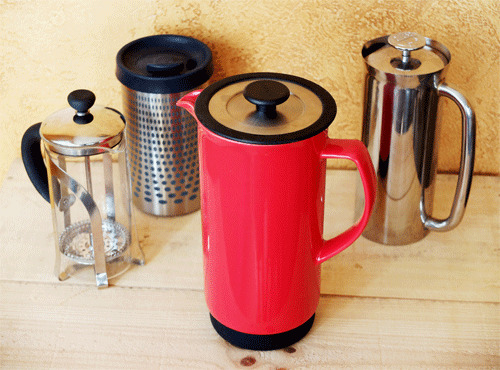 This is the first ceramic French press we have tried, and we like it. I’m a big fan of the French press. It’s simple to use and makes a great cup of coffee. I have spoken to a number of professionals in the coffee business who make their own coffee at home with a French press. Nothing fancier or more expensive. The French press in the video above was sent to us by the folks at FrenchPressCoffee.com. It’s a 32-ounce model, which make it good to have on the family breakfast table, or on the back deck with friends on a spring morning. 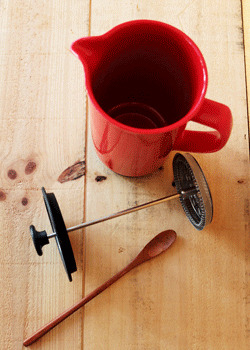 In its component parts: The pot, the plunger with filter screen, and a wooden stirring spoon. I like this model for a number of reasons. First because I like the French press anyway, and own several different types. And I like this particular model because of its design and the fact that it’s made from ceramic with a lead-free glaze, stainless steel and silicone. Or, to put it another way, there’s no plastic. Plastic is pretty much unavoidable if you want to use a drip brewer or any kind of single-serve system. But it’s easily avoided if you use a French press. And while I’m fine with my glass and steel French presses, I think the ceramic one will become my favorite. I prefer it over glass, because I’m less likely to break it. And I prefer it over steel because I find steel to be a little cool. There’s something warmer and more homey about ceramic. Anyway, I like this French press for both its design and its materials. It’s a keeper. You can learn more about it at FrenchPressCoffee.com. My new ceramic French press, along with some other press pots.